After standing vacant for nearly a decade, the final lot leveled by the 2009 natural gas explosion is bringing new community benefits to downtown Bozeman. 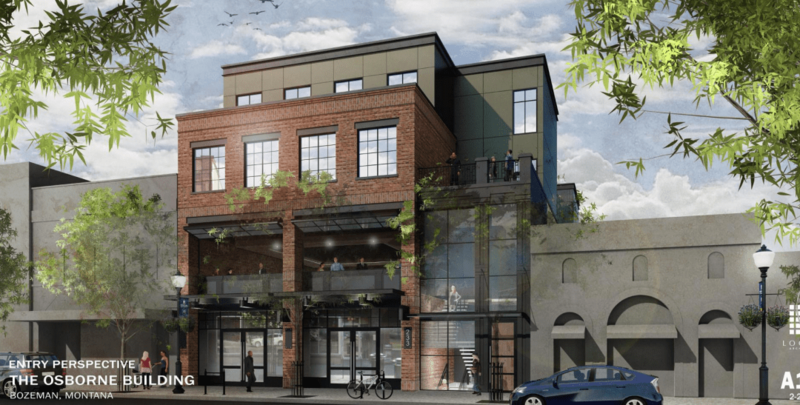 The new Osborne Building at 233 E. Main St. will be an innovative reflection of Bozeman’s modern economy, with restaurant space, rental office space for nonprofits that serve low-income communities, and flexible office space for startups and small businesses. The concept for the new 33,000-square-foot building was developed by local businessmen Bryan Klein, Casey Durham, Chad Bottcher and Jamie Bottcher, who wanted to find a solution for the lot that would not only address a longstanding vacancy but also help meet community needs. The building is designed by Locati Architects and construction is scheduled to begin this month. MoFi is a double bottom line, non-bank lender that provides loans to individuals, businesses and communities outside the financial mainstream. MoFi believes that access to responsible, flexible capital is a fundamental right, and that when “nearly bankable” people and projects are given access to capital they thrive. MoFi operates across the Northern Rockies with offices in Missoula, Bozeman and Boise, and in the last decade has provided nearly $500 million in financing to hundreds of borrowers. Learn more at www.mofi.org.